I read Hannu Rajaniemi’s The Quantum Thief late last year, and loved it. At the time I was not aware that the book was the first part of trilogy. 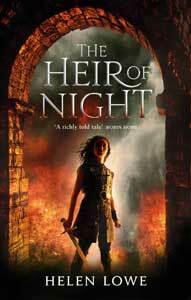 There was clearly scope for a sequel, but I felt the book worked well as a standalone novel. It wasn’t until I got to the last few pages that it was clear to me that there was a plan for more to come. That first part of the “more to come” turned up on Christmas day in the form of The Fractal Prince – a gift I was very happy to receive. The book picks up the on-going story of the infamous Jean De Flambuer and his Oortian co-conspirator Mieli: pretty much straight from the point we left them at the end of The Quantum Thief. Much of the action of the story takes place on Earth, or at least in the city at the heart of the place that Earth has become. Almost nothing about this Earth is recognisable to the reader. The environment, (physical, cultural, and conceptual) is altered in just about any way you care to name. As with The Quantum Thief, this is a story with layers, as well as plenty of smoke-and-mirrors. Yet having experienced the first book, I felt confident that despite my initially fragile grasp of just how the world I was experiencing in The Fractal Prince worked, the story would reach a satisfying conclusion. So did it? Well I was satisfied, as I enjoyed this book very much. But I am less clear that a conclusion was reached. 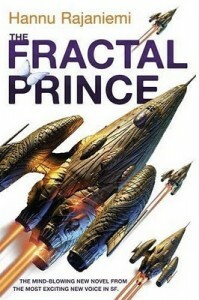 To me, The Fractal Prince is much more of a set up for Book Three in the series, than The Quantum Thief was for Book Two. This is a weakness often associated with the second book in SFF series, and did detract from my enjoyment of The Fractal Prince — but not too much. Having said that, this book does expand our knowledge of the personalities at the heart of the Sorbornost (the social construct that dominates the inner system), their conflict with the competing Zoku guilds, and with each other. You also learn more of Jean De Flambeur’s origins and motivations — if still being a little unclear about his ultimate goals. These are the major plot elements that emerge throughout the book, but clearly with more to come in Book Three. Yet for me, the central themes of this book are the transformative effects of technology and information: how we use these to alter the world, alter ourselves and be altered in return, and the unintended places this can take us. Even more so, there is the matter of scale and control, and the way that this impacts technology and the world as information. These themes are interesting to me as a reader, and are clearly valid extrapolations of some of the technologies we already see emerging in the real world today, such as nanotechnology and the ever-increasing scope of information technologies. Apologies if the above appears a little obscure as an illumination of the story being reviewed — but read the book and then let me know how you think I have done! Needless to say, readers who prefer their storytelling linear, with all plot elements clearly signalled, may not find The Fractal Prince to their taste. I love all of these books, and highly recommend them. If you have also enjoyed them, then you will most likely enjoy The Fractal Prince as well. Andrew Robins is a long time reader – and sometime reviewer – of science fiction, fantasy and history. People pay him to test stuff, mainly radios, which most of the time is more fun than it has any right to be. Any and all views expressed in this review are entirely his own. To read more reviews by Andrew, see “Book Reviews for ‘on Anything, Really’“in the right hand side bar. Small typo there: Sobornost (Собо́рность). I’d like to also include “The Rapture of the Nerds” by Cory Doctorow and Charles Stross in the list of similarly-themed books, but of course it’s pretty much a light-hearted satire. Thank you, Otto–you will see I have made the correction. That’s an interesting review. 🙂 I haven’t had time to read this book yet, but I’ll try to read it in the near future, because I liked the first part. I’m really looking forward to it, too. Like Andrew, I enjoyed The Quantum Thief very much when I read it.